What can I say. I forgot to take photos of the flowers made for this wedding because I was gelatinous with fatigue (to borrow a line from Orwell's 1984) from the wedding the day before. But one thing's for sure: I shed tears when I saw the bride walk down the aisle (left) as the groom awaits at the altar (right). I don't know, but she looked really really happy. Kat was beaming and beautiful. Her gown (by Manny Mondelo) was smashing. For the aisle, we used lots and lots of goldenrod (Solidago) chosen for their bright, golden flowers. In between pots of goldenrods are minimalist arrangements of Oncidium which pretty much connects the rites to the reception thus establishing the continuity of the design. 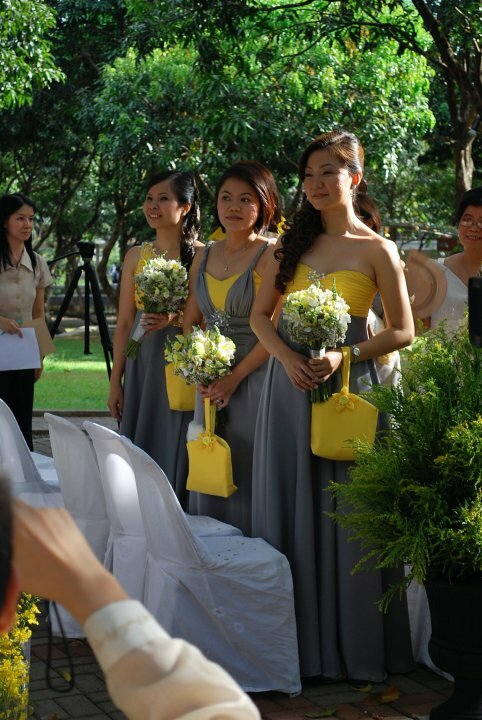 Inside the Pavilion, Macy Dy of K. by Cunanan Catering, played with ash & yellows to create that soft, laid-back look. Apart from yellow / orange roses, she also used lemons and rose cacti (left) for the centerpieces. In keeping with the theme, the couple gave away dried mango balls in these cute little bags which carry the design of their invitations. Looking forward to the official photos! :-) Thank you very much, Sherwin + Kat! You will be terribly missed. P.S. I rarely do this, but the coordinator for this event, Making It Happen, deserves special mention. I've worked with so many event coordinators before, but here's one that's not only efficient, they work quietly behind the scenes (as coordinators should), and were really really nice to everyone. No throwing their weight around or anything of the sort. And they speak great English, too. *laughs* I know that's hardly a qualification, but it is for me. Open Mondays to Fridays from 9am to 6pm. Hi Dylan! 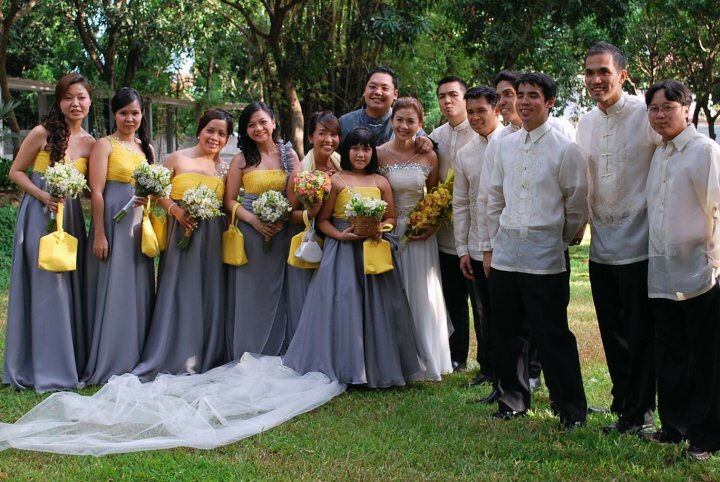 Thanks so much for arranging my super elegant bridal & entourage flowers! More creative ideas to come I'm sure. Keep up the excellence and the passion in whatever you do.